Perhaps the full-on onslaught of theme park after theme park is slowly getting to us finally but everyone was a big irritable this morning. It may also have been the fact that we didn’t have breakfast this morning, on account of our pre-booked character breakfast at Tusker House inside Animal Kingdom. Our spirits are always lifted a bit whenever we enter or leave the gated community where the villa is located, as Joey has convinced himself that he and he alone can open the gates by shouting out the magic words ‘Zim Zam Zoom’ just as the car approaches. We arrived at Animal Kingdom, apparently the largest of all of Disney’s theme parks (you could fit the entire Magic Kingdom into its car park) and were gratified to see that just a small handful of parking sections were occupied and operating. We really have hit the sweat-spot with this particular week. The summer holidays have tapered off and the local population is back at school already. The weather is pretty much perfect and the wait times everywhere are, for the most part at least, non-existent. Our passes let us through without the need for fingerprint scanning this time. We’re not altogether sure why but neither are we complaining after having had problems at the Magic Kingdom the other day. Again, we had little clue as to where we were going or which direction to take but we ultimately set of towards Camp Mickey & Minnie and in the general direction of Africa. 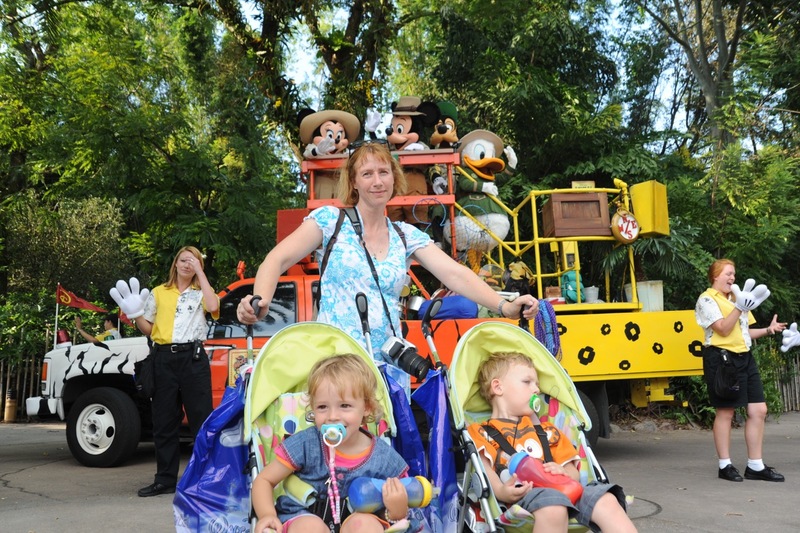 We latched onto some characters that were floating about and duly snapped the necessary with the kids before making our way towards Tusker House for our breakfast. Unfortunately, in our haste to get to the park on time this morning to make this very appointment, we’d overcooked things slightly (no pun intended) and were too early to check into the restaurant so we wandered through one of the nearby animal and bird trails to kill some time. When we eventually made it into the restaurant, we ate our fill and all started to feel just that little bit more human again. The kids really enjoyed all the characters as they came around to the table - Joey more so than Jennifer. ￼Joey’s face always lights up when he interacts with he characters and it’s a real treat to see. Jennifer at this age is just as interested in her food as the characters and could go either way. A nice touch was when all the kids in the restaurant were each given little musical shakers and were led around the restaurant, conga-style, by the characters in a musical dance - and I use the word musical here ... quite wrongly. The centrepiece of the Animal Kingdom park is the huge Tree of Life with all manor of animals carved into its enormous trunk. Beneath the tree is the It’s Tough to be a Bug 3D attraction. Since we were so close, we decided to take the kids in. It was only a marginal success as far as the kids were concerned. Between the water squirts, smoke effects and bugs emerging from the ceiling, Jennifer was not very happy with the whole experience. We thought we might have better luck with the Festival of the Lion King back over in Camp Mickey & Minnie. This is a circular stage show with acrobats and huge mock animals and it really was a very good show to watch. Sadly, Joey was playing up and Sandy had to take him outside before the show started so it was just Jennifer and me that had the pleasure. Joey ended up outside having lots of funs with various characters, such as Chip and Dale, which are dotted around the camp. The African Jeep safari was next up on our trail. As fake safaris go, this is a really good one. It really took me back to the many ours of driving around the Kruger National Park in South Africa and it reminded me that I must take the kids there some day for a real safari experience. The kids were in awe each time we saw more animals around each turn. After Africa, we set off towards Asia, where Tigers and other Asian wildlife awaited. We also wandered through more animal and bird trails and the kids got a big thrill out of seeing the various fishponds and the hippos in particular. We also encountered more characters on our travels and the fact that the park was only lightly populated with visitors meant that there were never any large queues to get up close and personal with them. Since the last time we visited this park, a new roller coaster has sprung up. The Himalayan Mountain is an impressive sight and since the single-rider line was a direct shortcut to the front of the line, I decided I’d give it a go. It’s a slightly odd ride in that it goes both forwards, then backwards and then forwards again but along different sections of track. It has a couple of nice dips and fast turns too so it’s a pretty good roller coaster at the end of the day. Sandy declined the opportunity to have a go but I was keen for a second run and trotted back towards the single-rider entrance again. As I tried to take a small flight of steps in a couple of jumps, I felt my left calf muscle snap and I was suddenly in agony. ￼Ouch! It was very quickly apparent that I wasn’t going anywhere in a hurry and I was suddenly barely able to walk so I had to sit down on the steps. We still had a half-frozen bottle of drinking water so we applied this to my calf and Sandy slipped me a couple of painkillers. I wasn’t in a lot of pain per se but I couldn’t walk straight on my left leg and ended up hobbling slowly for the remainder of the day. Trying desperately not to let the leg injury put too much of a damper on the day, we hobbled over the bridge towards Dino Land (I gave up on the second attempt on the roller-coaster). We had thought that this might be the area that the kids would enjoy the most but they’d both drifted off to sleep by the time we got there so we sluggishly made our way towards the first aid building instead. By sheer coincidence, it was located just about as far from the injury site as could possible be the case so it was a long and arduous walk. When we got there, the nurse strapped an ice pack to my calf and I was given another couple of painkillers. The daily parade was just about to start so we found prime spots just outside the first aid building and sat there whilst it danced and sang its way past us. ￼Jennifer was already awake by now but we had to wake Joey up for it. They both seemed to enjoy it a lot. Joey gets very happy whenever we see Mickey or Minney and they were both present. With the parade over, we hobbled back to Dino Land to catch a couple of turns on the dinosaur ride (which is pretty much the same things as the flying elephants at the Magic Kingdom) before letting the kids into the dinosaur playground. In the event, the park closed at five and the kids only had less than ten minutes to run around in the playground before we made our way to the exits. The tram ride was very brief. Only two car parks were being served. When we got back to the car, I realised that my mobile phone was gone. Oops! We definitely had it earlier in the park so it must have slipped out en-route somewhere. ￼I made my way back via the tram to the guest relations desk near the turnstiles but the phone had not (yet at least) been handed in. I filled in a form and was given a number to call tomorrow morning for Disney’s grand central lost and found department, where all unclaimed lost and found articles are taken to at the end of every day. With a painful leg and no mobile phone, we left the park just a little dejected but we did stop in at the Golden Coral for dinner before getting the kids back home and tucked into bed. Whilst there, I took the opportunity to buy a bum-bag to keep all my bits and bobs safe for the remainder of the trip. Sandy and I watched the day’s photo takings and then cuddled up in front of a film for the evening. Predictably, Sandy never made it to the end of the film before nodding off.